It's officially Summer and I couldn't be happier. I want to make sure we really enjoy it because let's face it... they grow up too fast. I can't believe the difference in my oldest two over the course of a nine month school year. It's just crazy! Gonna try to soak up every second. Here's to lazy mornings, running through the sprinklers and lots of reading. enjoy these summer days ahead! Goodness me! They look so much older. That is craziness! Ya for summer!!! 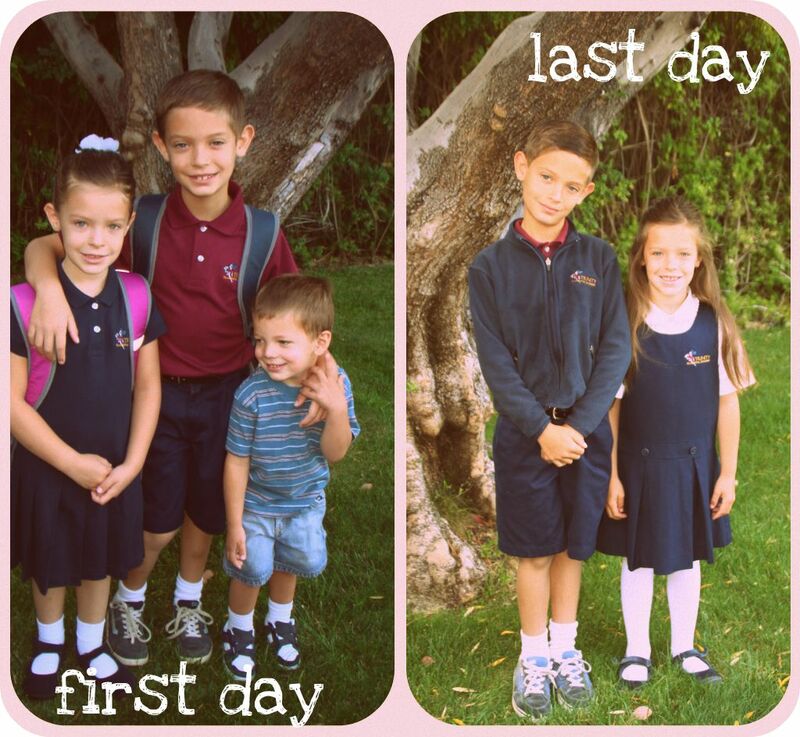 It is so crazy how much they change in one school year! Yes, bring on the lazy days! i love these before and after pictures....what a beautiful family! have a super fantastic summer! Sadly, summer is going to fly by to... embrace the moment! yay for summer!! we have two more full weeks of school. watcha gonna read with the kids? i need some summer ideas. last summer i read the adventures of dr. dolittle to them. and the second we plan a weekend up there, i'm emailing you. those lazy mornings are the best part. or maybe the sprinklers. either way, YAY SUMMER! My husband and I just started talking about how we will need to start introducing potty training to B soon... we still can't even believe we are parents and soon we will have a 2 year old! It goes so stinken fast!! Thanks for stopping by my blog and for your sweet comment!! oh my how fast they grow and change. I'm with you! I try to soak every second up!! So cute! It's really amazing how much kids change over the course of a year. Congrats on the start of summer!! !